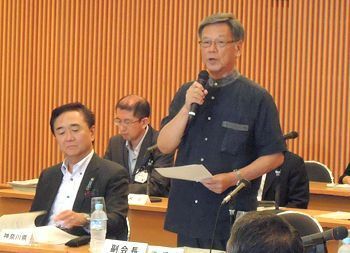 While speaking at the Todofuken Kaikan in Chiyoda, Tokyo on the morning of July 25, Governor Onaga calls for MCAS Futenma to be relocated outside of Okinawa. On July 25, the Governors’ Association for Military Facilities in Japan (chaired by Governor of Kanagawa Prefecture Yuji Kuroiwa) comprised of fifteen prefectures of Japan where the U.S. has military bases, paid a visit to Minister of Defense Gen Nakatani at the Ministry of Defense. The Governors’ Association made special requests in response to the case of a woman assaulted and killed by a U.S. base employee in Okinawa, calling for preventative measures to incidents and accidents caused by U.S. military personnel, and for the revision of the U.S.-Japan Status of Forces Agreement (SOFA). The Association also submitted a petition on measures relating to U.S. military bases. According to Governor Kuroiwa, Minister Nakatani said that he first wants “to properly attempt improving implementation of the SOFA,” stopping short of actual revision. In regards to the continuation of U.S. military realignment grants on and after 2017, and the reopening of the liaison conference between the U.S. and Japanese governments and the Governors’ Association for Military Facilities in Japan (which has not taken place since 2008), Nakatani responded that he “wants to consider” these options. On the same day Kuroiwa also made an appeal to the Ministry for Foreign Affairs, and exchanged ideas with the U.S. Embassy in Japan. On the morning of July 25, both the appeal and petition were adopted at a regular general meeting of the Governors’ Association. Due to the establishment of Kyogamisaki Communications Site in Kyoto Prefecture, Kyoto has been added to the Association as the fifteenth prefecture. At the meeting vice-chairman of the Governors’ Association Takeshi Onaga spoke about construction of a new base in Henoko accompanying relocation of MCAS Futenma. He warned not to be “drawn in by the fixed idea that Henoko is the only option [for relocation].” In addition, he emphasized his desire for the Government of Japan to consider all methods of relocating MCAS Futenma outside of Okinawa. Onaga said that the Supplementary Environmental Agreement to the SOFA that was put into practice last year in September might have appeared to be a step forward, but that there are drawbacks as well. One concern is that a survey of buried cultural properties on MCAS Futenma has yet to be achieved.